As Vancouver’s housing market reached dizzying heights in early 2016 many buyers were forced further out into the suburbs of the Fraser Valley. Detached houses in the suburbs exploded into multiple offers, and like clockwork, as Vancouver detached homes cooled so too did the Fraser Valley. It appears to be a follow the leader scenario, with the condo market now following a similar pattern. Vancouver condos hit a record high average sales price over $1M this past month. This continues to push buyers further and further east, as buyers squeeze each other out for the remaining bit of affordability. As of January, inventory in the Fraser Valley plunged to decade lows amid buyers desperately bidding up the remaining housing stock. This has sent prices surging to new highs, with the average sales price showing a 31% increase year over year and the median sales price jumping an eye watering 45%. Bidding wars appear to be growing stronger, as many buyers rush to beat expiring rate holds and rising interest rates. In January, 53% of Fraser Valley condos sold over the asking price, just off an all time high of 59% in December. 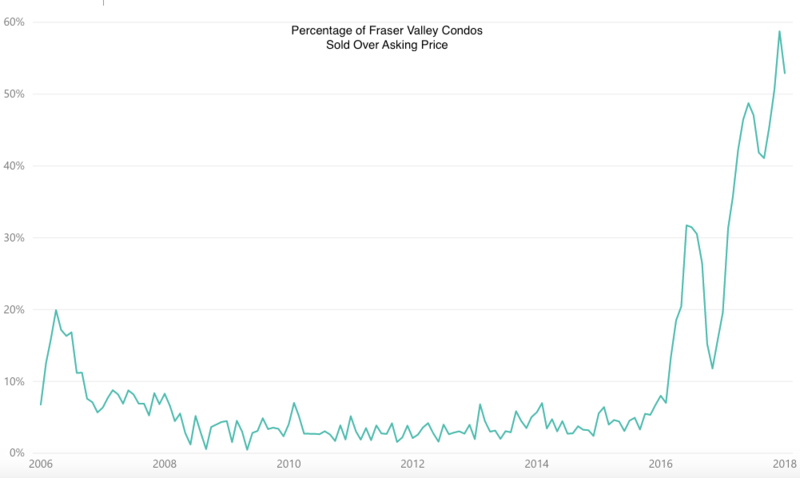 Percentage of Fraser Valley Condos sold over asking price. Meanwhile, speculators have been gifted with incredible liquidity as the median days on market falls to just 8 days. This has pushed the number of condos being flipped within a 12 month window to new heights. Condos flipped within a 12 month period made up 7% of condo sales in January. 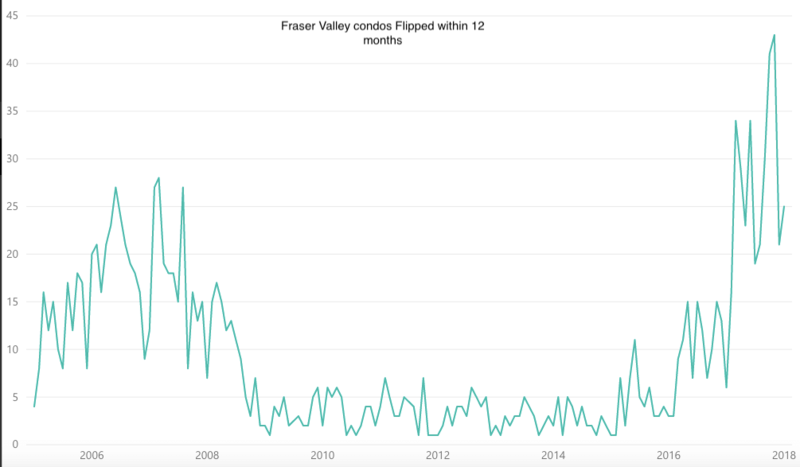 Fraser Valley condos flipped by month. As valuations push new extremes in the condo market, it remains to be seen where the threshold lies before buyers simply surrender to further price increases.